No recipe collection would be complete without dessert. And dessert tastes even better in the outdoors. 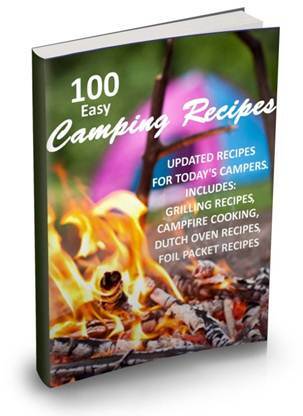 Below are several mouth watering dessert recipes just made for camping. Slice bananas. Place all 4 pie crusts on a 9 x 13 inch baking sheet pan. Layer on pie crust as follows: 3 or 4 slices of banana, 2 or 3 peanut butter cups and top with a few marshmallows. Cover the baking sheet with heavy-duty aluminum foil. 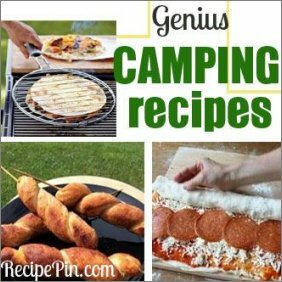 Place pan on top of grate over a campfire for approximately 10 to 15 minutes. In a 12 inch Dutch oven, pour both cans of pie filling, top evenly with chocolate cake mix then pour soda on top. Place Dutch oven on top of hot coals or on a grate. Let cook for 30 to 35 minutes or until the cake looks to be done. Preheat grill. Wash and dry chicken breast. Tear off four large squares of foil. Place the following on each foil square: 1 teaspoon softened butter, 1 teaspoon onion soup mix and 1/4 teaspoon paprika. Place equal amounts of chicken on all four squares. Drizzle remaining butter and soup over chicken. Top with equal amounts of cream and mushrooms. Wrap foil to form a packet and tightly double crease the folds. Cook on a hot grill for 45 minutes or until chicken is done. Turn packets every ten minutes. Yield: 4 servings. Spread peanut butter on four graham crackers; spread the other four with the marshmallow fluff. Press slices of the banana into the peanut butter and dust with chopped nuts. Place the marshmallow crackers on top of the peanut butter and banana crackers and lightly press together. Wrap each one in wax paper and then wrap in foil. Over medium heat grill the smores for approximately 10 minutes, turning twice. S'mores are done when marshmallow filling is gooey and somewhat toasted. Preheat the grill to 325 degrees F. Coat a 12 inch cast iron skillet with vegetable oil. Prepare brownie mixture as directed on the box. Pour brownie mixture into skillet and top with crushed graham crackers. Put the skillet on the grill and let cook for 25 to 35 minutes. (Be careful not to overcook). Remove skillet from grill. Place the chocolate chips on top and spread evenly with rubber spatula. Place a thin layer of marshmallows on top of chocolate. Put the skillet back on the grill until marshmallows become lightly browned. Brownie will continue cooking in hot skillet. Stick a knife around the edges to check if brownie is done. Be sure to use a large spoon and scoop out servings instead of cutting with a knife. Mix together the cinnamon and sugar. Flatten out a single biscuit and spiral it around the top of a stick. Hold the biscuit over the campfire until done then roll it in butter and the sugar mixture. So good! Leaving the bottom of the apple intact, remove the core. Mix all the rest of the ingredients together except for the margarine. Pack apple with the dry ingredients placing margarine on top. Wrap the apple in foil from the bottom up, twisting the ends tightly then forming a handle. Place the apple on top of the coals (right-side up). Let cook 12-18 minutes rotating occasionally. When the apple is cooked, open the foil and let the apple cool for a couple of minutes before serving. 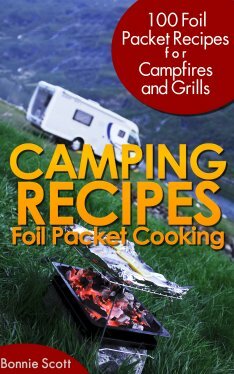 Place a single flour tortilla on a 12 inch square piece of foil. Smear the center of the tortilla with peanut butter then top with a portion of marshmallows and chocolate chips. Fold up each end of the tortilla then roll it up like a burrito. Wrap the burrito with foil making sure not to leave any open ends. Place on a grate or iron skillet then heat for approximately 5 to 10 minutes. Let cool before serving. This is a great recipe for kids to get involved in. Each child can make their own burrito dessert, then write their name using a sharpie on the foil before cooking. Tear a hole in the middle of each biscuit. Using an iron skillet or saucepan, heat 1 to 2 cups of oil until hot. Place biscuits (side by side) into heated oil and let brown, turn the biscuits over with a spatula and let the other side brown. Remove biscuits from oil and place on a paper towel to drain. Sprinkle each with chocolate syrup, powdered sugar, sugar and coconut.